After the success of the super hit entertainer, Eedo Rakam Aado Rakam (ERAR,) Raj Tarun is seen in a brief cameo in Nani’s Majnu. Although he started working on a film Raju Gadu Yama Danger under a debut director, the film has been shelved for reasons best guarded. After delaying his next Kittu Unnadu Jagratha, where he will be essaying the role of a dognapper. 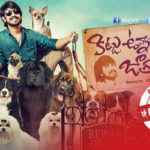 The teaser of Raj Tarun’s next, ‘Kittu Unnadu Jagratha’, captures the character as well as the mood of the nation funnily well. The protagonist makes it known that he abducts pets for a ransom. He has chosen the easier path, because he doesn’t have to maintain a den, etc if the kidnapped is not a human but a dog. But that’s not all. He is particular about how the owner pays him. It has to be in denominations of Rs. 100. The dog-kidnapping don of Rs. 100 denomination won’t spare you if you pay him otherwise. Directed by Vamsi Krishna of Dongaata fame, it marks the the re-arrival of Arbaaz Khan (Salman Khan’s brother) on the Telugu screen. Anu Emmanuel of Majnu fame is the female lead. Music-directed by Anup Rubens, the film has dialogues by Sai Madhav Burra. The story is by Srikanth Vissa. Cinematography is by B Rajashekar. Editing is by MR Varma. Art direction is by Avinash. The AK Entertainments product will hit the screens in early 2017.